While Disney World offers a vast variety of different resorts to choose from for guests staying on property, the Disney Vacation Club (DVC) Villas offer even more options and experiences, particularly when it comes to room sizes! During my last few trips to Disney World, I had the opportunity to enjoy stays at several different DVC Villas; but today, I’m zeroing in on Disney’s Beach Club Villas in this review of a Disney’s Beach Club One Bedroom DVC Villa. First of all, the Disney Vacation Club is Disney’s own timeshare program where members purchase and use points for their vacation experiences. 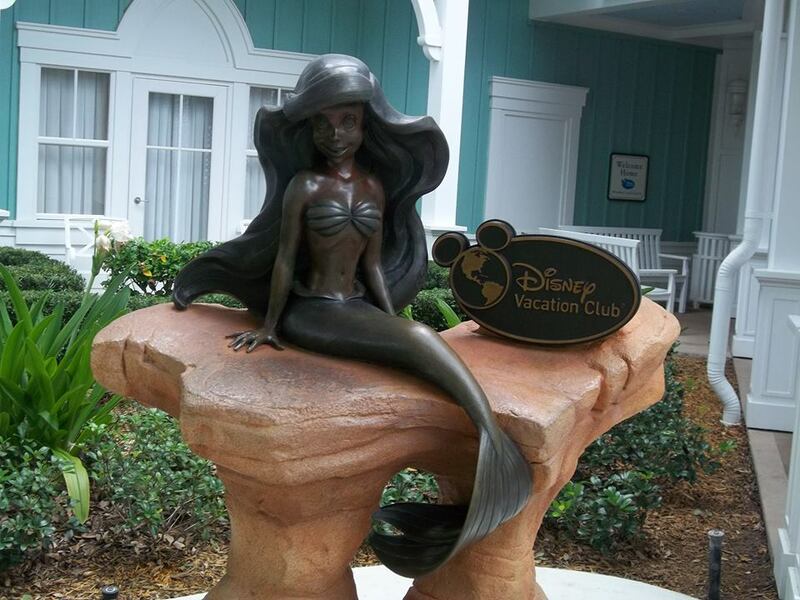 It can be difficult to understand, but Disney Vacation Club (DVC) 101: What is DVC? can help fill in the gaps. 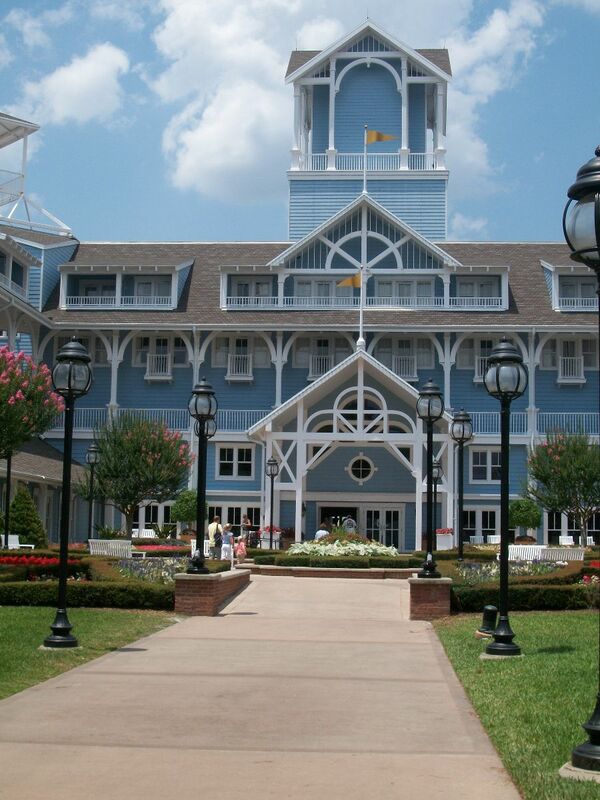 If you are not a Disney Vacation Club Member, the good news is that you can still stay at a DVC Resort! You can do so by booking through Disney, just as you would any other resort; however, other guests like to rent points or even buy points from other members, but you definitely want to make sure that the seller is legitimate and reliable. 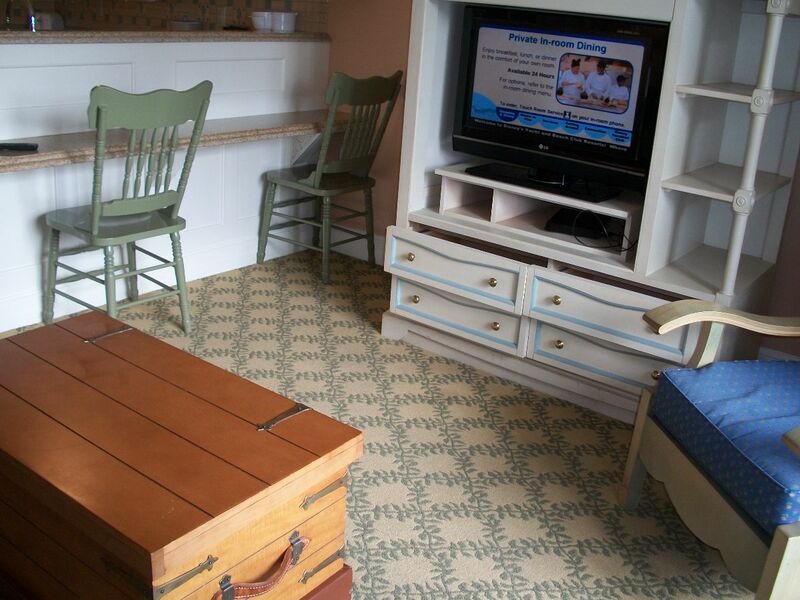 Earlier this year, my family and I booked a stay at one bedroom DVC Villa at Disney’s Beach Club. 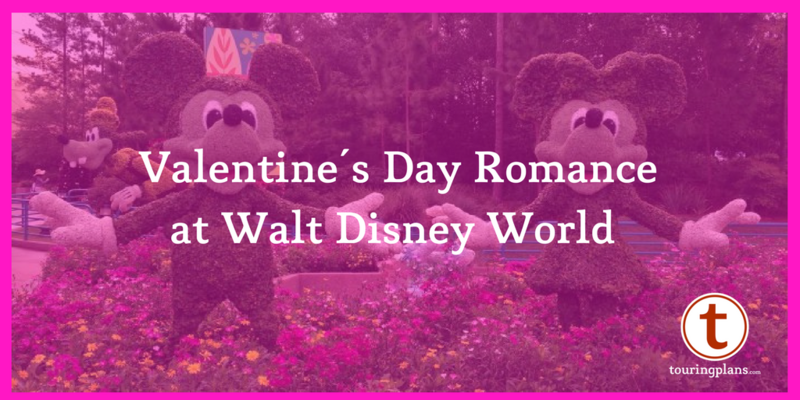 This resort is very popular and has one of the best locations at Disney World in that it’s next door to its sister resort, the Yacht Club, as well as the Swan and Dolphin Resort. Across the water, there is the Boardwalk Inn Resort and the Boardwalk itself with it’s dining, shopping, and live entertainment to take advantage of. But wait! It’s get even better! The Beach Club is also a short walk from Epcot, and a somewhat longer walk, or boat ride, to Hollywood Studios. In fact, during my stay, I could see the fireworks from Epcot’s Illuminations from the Beach Club grounds. The Beach Club features a light and airy, beach theme with a vintage flair. Pastels and little seaside details can be found all throughout the resort, from the carpets to the light fixtures; but one of the things the Beach Club is most known for is it’s pool, Stormalong Bay. Many say it is the best pool on Disney World property and I would agree! The smallest villa offered at the Beach Club Villas is a Deluxe Villa, which sleeps up to four adults. It’s similar to a standard resort room, just with more amenities. The next size villa is a one bedroom, which is what I’m focusing on today. This villa can also sleep up to four adults, but it offers more space than a Deluxe Villa. Finally, the largest villa offered at the Beach Club is a two bedroom villa, which can sleep up to eight adults. My family and I had stayed at the Beach Club before, but never in a villa so we were excited to enjoy a whole new experience at this gorgeous resort. 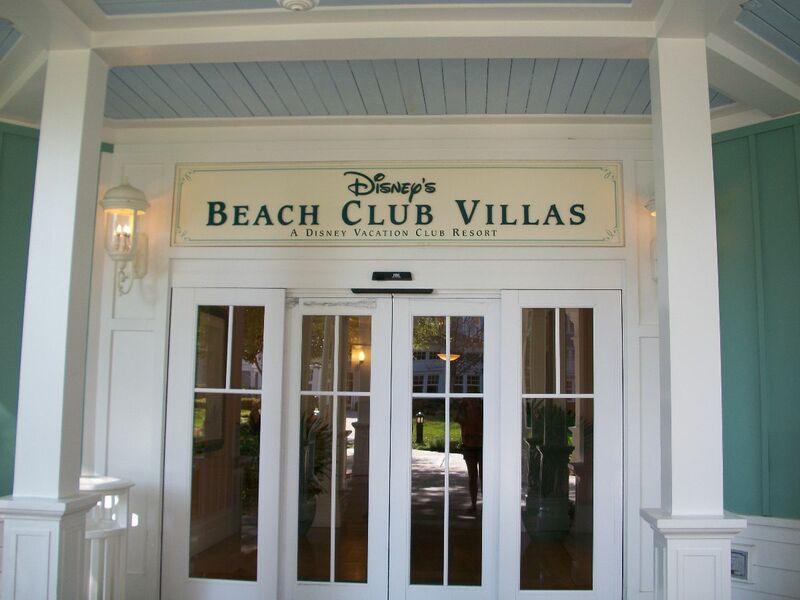 The first thing I discovered upon arriving at the Beach Club is that the Beach Club Villas are located in a separate building. I wasn’t so sure if I would like the idea of being separate from the main lobby, restaurants, and gift shop; but the villas were connected to the main building by a very short, covered walkway. I can honestly say that throughout our week-long stay, I never felt removed or isolated at all. Also, this separate building that housed the villas was like a whole other hotel. 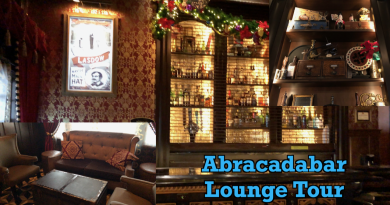 There was a mini-lobby, plus a beautiful sitting room, and a pool, all with the Beach Club’s trademark style. I felt like I had two Beach Club Resorts to enjoy with this set-up instead of one! In order to get to the paved paths or boat launch to Hollywood Studios or Epcot, we would have to take the path connecting the villas to the main resort, walk through the lobby, and then out the back door facing the Boardwalk. My family and I enjoyed being greeted by Cast Members in the main building, and the view of the lake and Boardwalk as we came out the door was like something from postcard. The scenery and convenience really sets the Beach Club apart from other Disney Resorts and is one of the many reasons why I love staying here! However, if we wanted to hop on a bus, we had to go through the resort’s main door, pass the bell hops, and down the covered walkway. That route proved to a little bit of a hike, but definitely better than some of the treks we’ve taken at moderate or value resorts. There may have been a shorter route, but this is what we could find. Fortunately, during our stay, we didn’t have to rely upon the bus transportation much. Right outside the villa entrance we found this statue of Ariel, from The Little Mermaid, which was quite appropriate since the Beach Club is a seaside resort. I appreciate when Disney weaves Disney characters and films into the resorts in a subtle way so that both kids and adults appreciate their resort. This is also a great spot for a photo-op! Don’t you just love the doors to each villa? 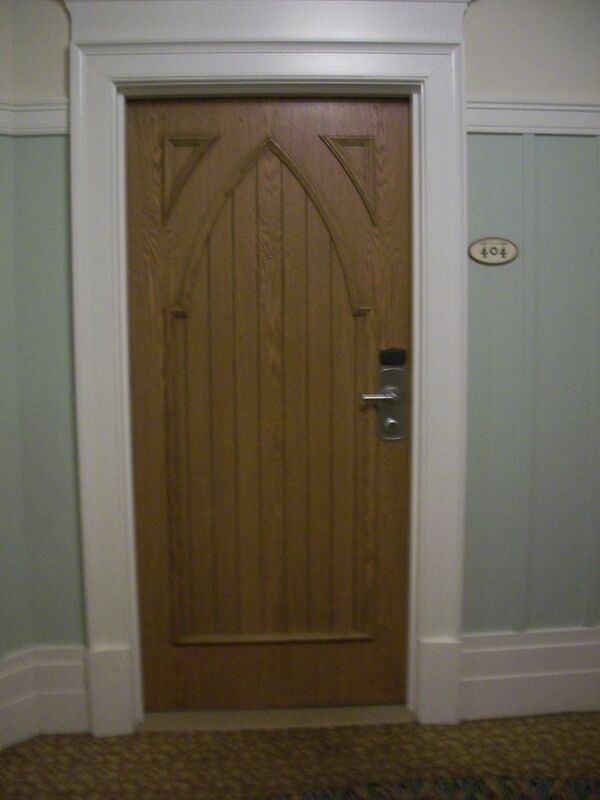 I want one of these doors for my house. 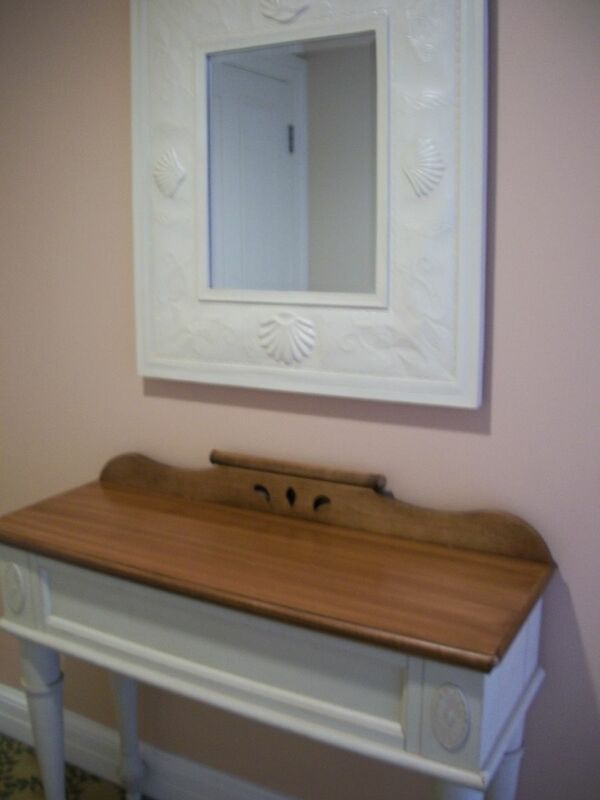 Just inside the door to our one bedroom villa was this little entry table and mirror. This is where we kept our MagicBands and sunglasses so we wouldn’t forget them before heading out the door. The living space of our one bedroom villa consisted of a full kitchen and living room, plus a bench seat and table. This floor plan is typical of most Disney Villas. The couch folds out into a bed and the balcony had space for a small table and two chairs.My favorite detail was the cute lighthouse lamp on the far table and the rustic trunk which served as a coffee table. The entertainment center in the living room featured a flat screen television and a DVD player. Most standard rooms at Disney World resorts do not have DVD players, so this was a fun extra for our villa experience and something we didn’t have during our previous stay in the main resort building. Unfolding the couch proved to be a bit of a chore; and while it wasn’t the most luxurious, spacious bed we’ve ever had, it was pretty comfortable all things considered. The biggest problem we had with it was the hassle of folding it back up in the morning and deciding who should do it! 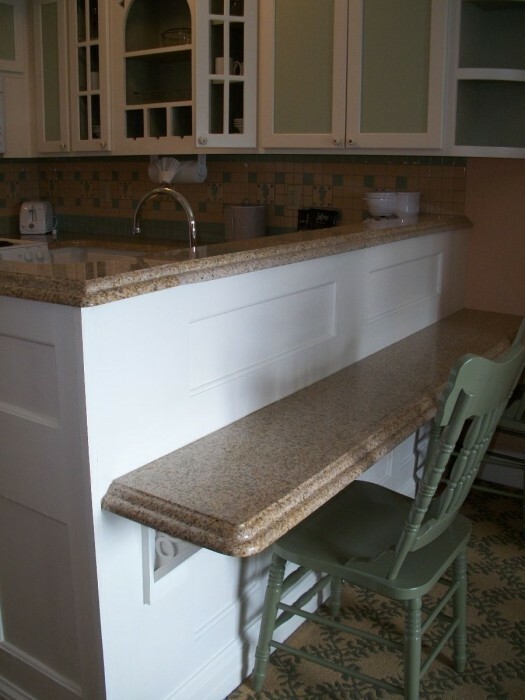 As there is no dining room table or chairs, this little breakfast bar came in handy. It’s a bit of a tight squeeze but did offer extra work space and seating for meals. Here’s a look at our villa’s full kitchen. I personally didn’t care for the tile or the shade of green on the cabinets, but it was spacious and came with everything you could need, minus the groceries. 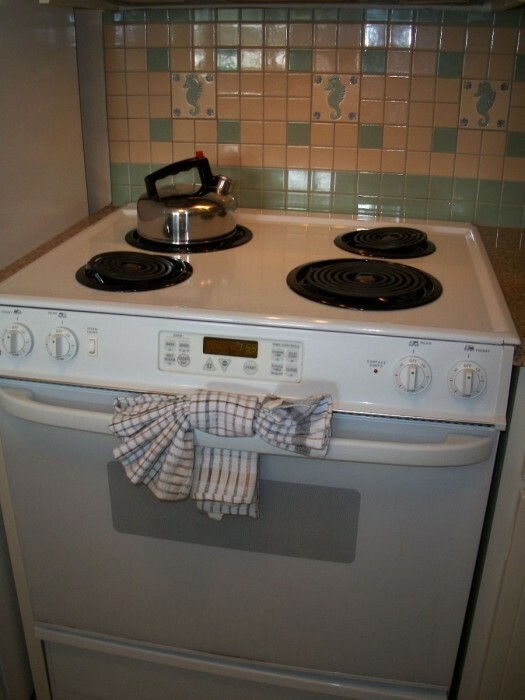 All villas that feature a full kitchen have a stove, oven, microwave, and toaster, as well as silverware, utensils, pots and pans, plates, cups, glasses, and more! The only kitchen luxury we wished our villa kitchen would’ve had would be an ice maker. Disney did provide an ice cube tray in the freezer; but with the four of us, and seeing how it was summertime, it just wasn’t enough! Take a look at the tile work above the stove. They’re seahorses! I loved all the little touches of the ocean throughout our villa. I never felt like I wasn’t in the Beach Club Resort, which was a priority for my family. 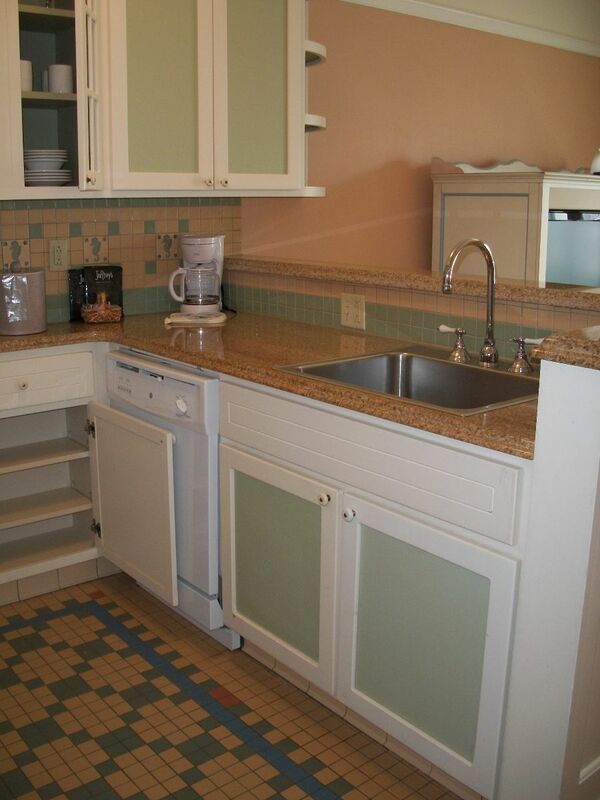 Every DVC Villa at Disney World offers a washer and dryer, except for Deluxe Studios. This was a big perk after considering all the times we have hauled bags of dirty laundry to one of the resort’s laundromats and then spending valuable vacation time switching loads. But during our stay at our Beach Club Villa, we would often toss in a load before heading off to the parks or before bed at night. The only problem we had when it came to our villa washer and dryer is that the box of detergent Disney provided was very small; and with four people needing to do laundry, it didn’t go far. Also, our dryer made a loud, squeaky noise when running, which became very annoying. Looking back, I should have informed the Beach Club about it, but complaining to the front desk is something I always dread doing. Fortunately, this is the first time we had encountered a problem like this while staying at a DVC Villa, so I doubt it’s a common problem. It’s also important to note that DVC Villas do not offer housekeeping every day while standard Disney Resort rooms do. Let me explain. If you are staying seven nights or less, you will receive towel and trash service on the fourth day. So this means you won’t get clean towels every night like you would in a standard resort room. If you’re like us, you probably will want to wash towels a time or two before that fourth day rolls around. 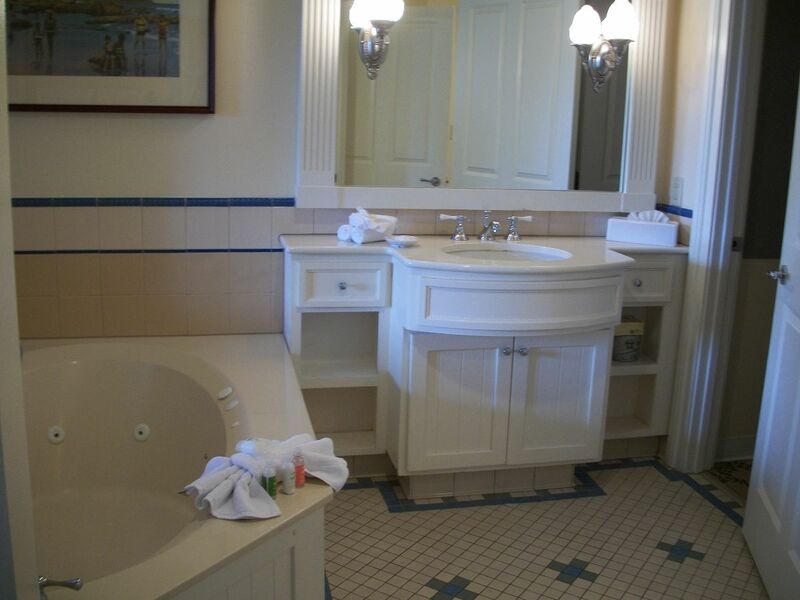 Okay, I’m a huge fan of the bathrooms at Disney’s DVC Villas. My family and I have stayed at moderate and value resorts during past trips and there are four of us in total. While Disney’s value and moderate resort rooms are incredible in their own right, things can get a little tight when it comes to the bathroom situation. 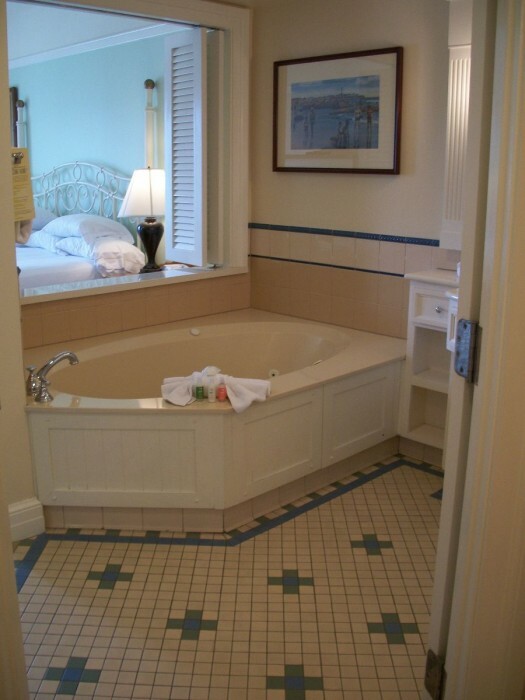 But this was most certainly not the case at our one bedroom DVC Villa at the Beach Club. Our villa bathroom was kind of like two small bathrooms in one, shut off in sections by different doors. 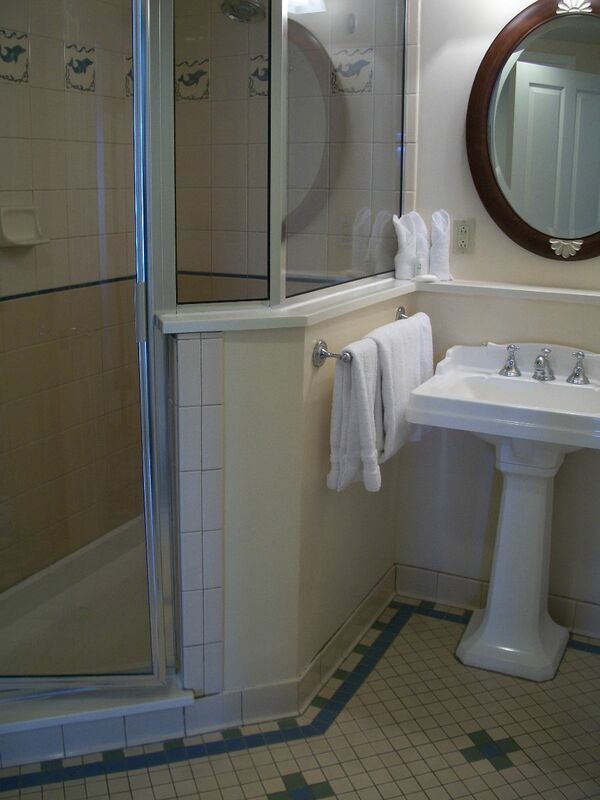 For example, one section contained a shower and pedestal sink while the other had another large sink and storage, plus a jetted tub, but both sections were shut off from one another by a door. The toilet was in a little section of its own behind another closed door for privacy. This means that three people can be in the villa bathroom at once without having to see one another! The shower was huge compared to most resort room showers and the tile showcased little dolphins. My only complaint? The shower door didn’t close all the way, as if it was out of alignment or something. I’m sure this isn’t true of every Beach Club Villa, but it was a slight annoyance throughout our stay. This is the other section of the bathroom. The sink offered lots of space and how could you not like that tub? Here’s another view of the tub. The shutters complimented the light and airy feel of the villa and could be opened up into the master bedroom or closed for privacy. This is a view of the bathroom through the open shutters. You can see into the other half of the bathroom from this viewpoint, as well as into some of the villa’s closet space, which was very spacious and contained the room’s safe for your valuables. This is the villa’s bedroom! The bed was very comfortable and just look at all those pillows! I must admit, I’m not a fan of the small strip of comforter that Disney uses on their beds. Some DVC guests prefer to use their own blankets, which I would recommend since, in my own experience, there are few to be found in the DVC Villas; but I must admit, I love the full Disney bedspreads that pull together the resort’s theme and hide little characters and Hidden Mickeys. While these strips do have some Disney touches in the pattern, they do next to nothing and just get in the way. 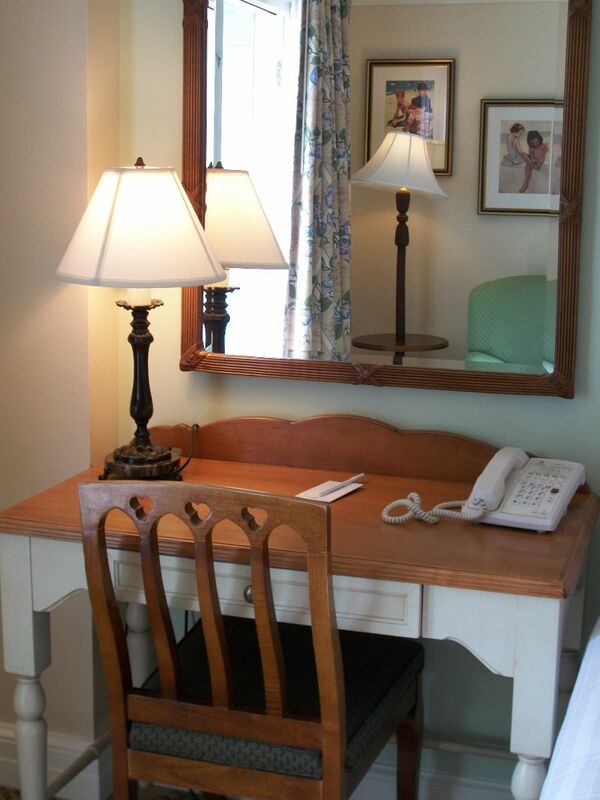 The bedroom also offered a comfy chair, this writing desk, and a dresser and television. The artwork consisted of framed watercolor paintings of seaside scenes and ocean retreats. While some resort artwork can be less than enchanting, I would’ve taken these pieces home if I could! Take a look at the curtains hanging in the bedroom window. They are covered with a fun, yet subtle, beach print and were hiding several Disney characters, plus a sandcastle that looks very familiar… There’s a Hidden Mickey too! 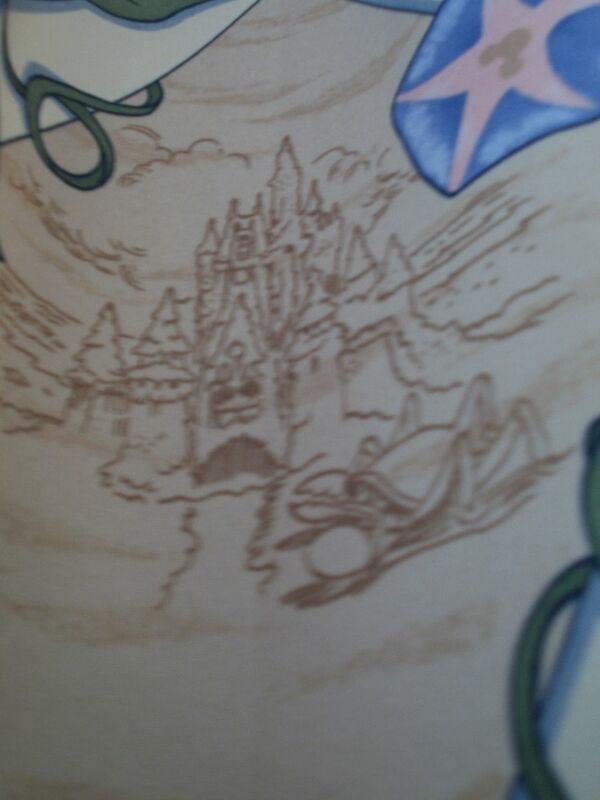 This is a fun detail for kids, and maybe even for “grown-up” kids too who enjoy a little magic here and there too. The balcony off our master bedroom was one of our favorite features! Our villa’s view was of the front entrance to the Beach Club Resort; and the white building and gazebo directly in front of us was the Solarium, a sunny lounge with tables and sofas and a television. It leads directly to the Beach Club’s Marketplace. From this vantage point, you can see just how close the Beach Club Villas truly are to the main resort building. When we had the balcony doors open, we could hear some of the traffic at the entrance, which could be irritating to some guests. However, when we had the doors shut, we could barely hear anything at all and traffic was lighter at night. While our villa didn’t face the Boardwalk or the Beach Club’s famous Stormalong Bay Pool, it still was one of the better views that we have ever had in all our resort stays at Disney World. Out of all our DVC Villa experiences, our stay at the Beach Club Villa was most definitely one of our favorites. Our villa offered us an even more luxurious stay than actually staying in the main building, but without losing any of the flavor, theme, and convenience of the resort itself. Also, while a standard resort room, Deluxe Studio Villa, and a one bedroom villa all only accommodate up to four adults, consider how much more space and extras you get choosing the one bedroom villa. The only downside would be the lack of housekeeping and that there is only one bed, which, while a slight hindrance, didn’t outweigh the full kitchen, laundry, and bathroom space. In short, we can’t wait to go back to stay here again! 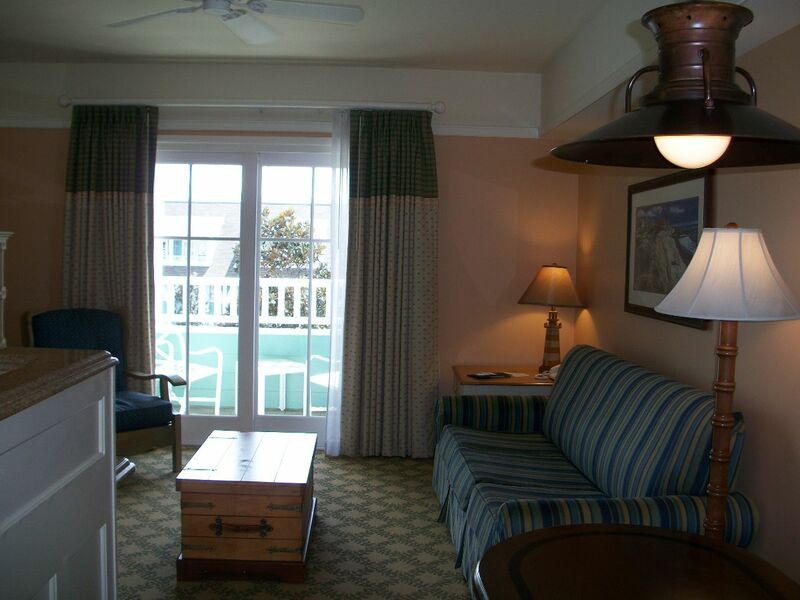 Have you ever stayed in one bedroom villa at the Beach Club? If not, would you? The layout looks almost exactly like the Animal Kingdom lodge One bedroom villa. We loved how roomy it was. My family and I stayed in a one bedroom villa at Disney’s Animal Kingdom Villas – Kidani Village a couple years ago and we loved it! We usually stay in a two bedroom villa at Saratoga Springs or Bay Lake Tower, but we decided to try something different since there were only 5 people in our traveling party instead of our usual group of 6. 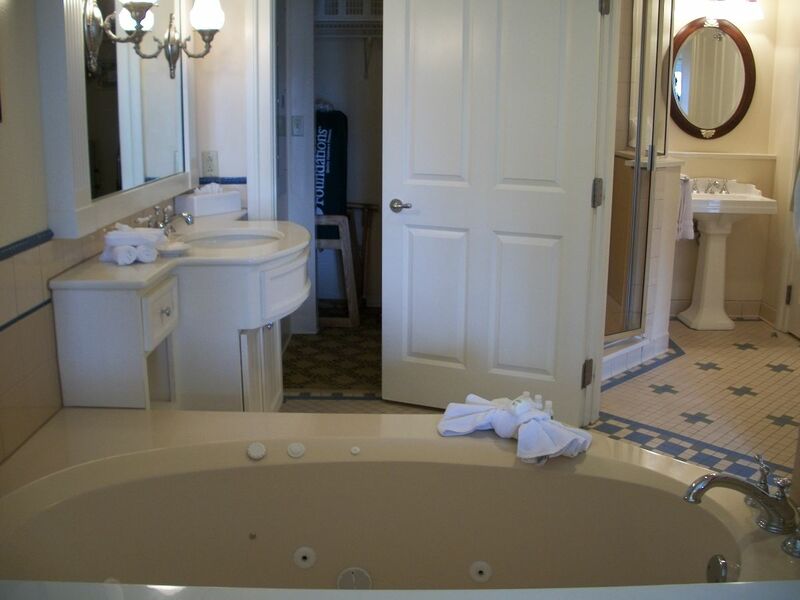 What we liked better about Kidani Village’s one bedroom villa vs. Beach Club’s one bedroom villa is that it actually has a full second bathroom off of the living room/kitchen area. This was so helpful getting 5 people ready each morning. It also had a cute pull out chair that turned into a bed that was perfect for my older son, while my younger son and I shared the pull out couch, and Grandma & Grandpa had the bedroom. The villas at Animal Kingdom Lodge are heavily themed in dark woods and rich tones so that makes them appear different even if the floor plans are very similar to all of the other DVC properties. They are very dark though – so much so that Grandma had to go to Target and purchase a small lamp to use in the bathroom to see to get ready! Thanks for the review. We have a 2 Bedroom Villa and an adjoining Studio Villa booked for our upcoming trip. For 6 adults and 5 kids we will certainly be glad to have the space, kitchen and laundry. While I have seen the layout and some photos before, your review is the most complete depiction I have found… it has reassured me that the extra money we are spending is worth it! Any idea on how much time the walk from the main entrance of Epcot all the way to the Beach Club Villas would take? Just curious if taking the monorail from Magic Kingdom to the TTC then on to Epcot and walking to the villas is still a time saver over dealing with the bus system. The walk from Beach club to the International Gateway (between France and the UK) takes about 3 minutes ( maybe 5 if you want to drag it out). As for MK to Beach club, take the bus. 1) going via Epcot would require a hopper if you had enter MK. 2) it is a long princess. We did the reverse ( resort through Epcot , monorail to TT , monorail to MK and boat to Fort Wilderness. It took over an hour. So I suspect a bus from MK to Beach club is your best bet. Also looks very like the saratoga springs 1 bed villa we stayed at in the summer. Seeing this has kind of disappointed me as I thought each resort would be noticeably different, but I don’t think this is. Maybe places like AKL and the Poly will change my opinion that they all look the same. I sure hope so! 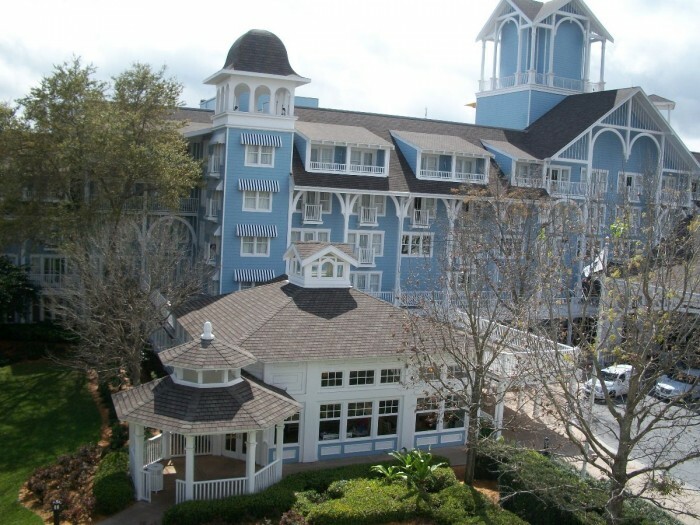 Very nice report, as a DVC member I prefer to swap and back and forth between the Boardwalk and the beach club. We are staying there next month in a two bedroom. Great report, thanks. It does (sigh) confirm my other research that Beach Club Villas won’t suit my usual stay, thanks to the bed configuration. My Disney travel buddy and I want separate beds, and really don’t want to have one of us on a sofa bed. As far as I can tell, only OKW of the DVC properties has this in less than a 2-BR villa. Can any DVC members tell me about other studio or 1-BR villas with 2 queen/full beds instead of 1 King? All one bedrooms have the king master. Some two bedrooms have 2 queens instead of the queen and pull out in the studio portion of the two bedroom. That may be what you’re thinking of? But the two queens are found in dedicated two bedroom villas. 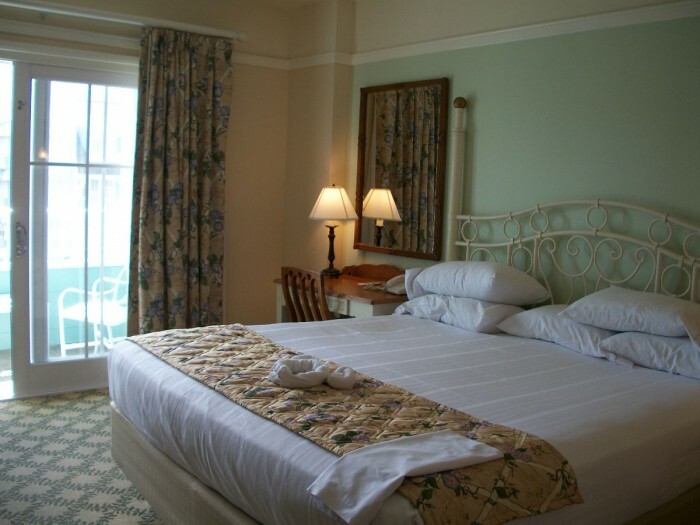 If you want two queen beds in something smaller than a two bedroom villa, you need to go to OKW. You do not have to walk all the way back to the main building to get to either the bus stop, Epcot etc… There are other pathways at the DVC villa. Just ask the concierge at the dvc desk! We recently stayed in a 1 bd in November and we had a large table with chairs as an eating area. It looks like you had that also in the picture you show the couch. It’s next to the kitchen. Not sure why it wouldn’t be in your room as an eating area or maybe you didn’t notice it was an eating area? I’m totally confused at this as well. We own at Beach Club, and always have a table and chairs as well as the breakfast bar. Your unit looks different. Is this a dedicated one bedroom? I will admit I’ve only been in dedicated 2 bedrooms and studios and not a dedicated one bedroom. I’ve always had the table and chairs in the 2 bedroom…. Heather, my villa had a booth off the kitchen, but not chairs and we tended to use it more for our workspace. The only chairs we had were at the breakfast bar, but perhaps this varies? Thanks for your comment! Just to echo a previous comment, you do not have to walk through the main lobby to get the bus. 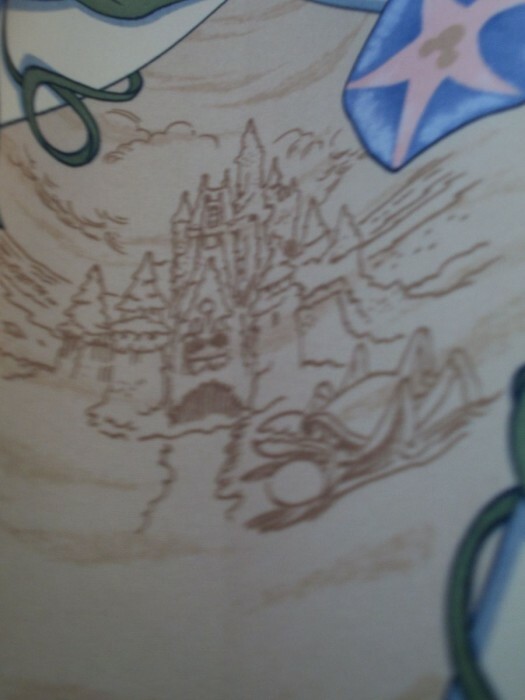 When you exit the villas, turn right at Ariel’s statue (instead of left) and that walkways takes you right to the circular entrance way outside. Or, if you are staying close to the parking lot, you can take the walkway to cross the street near the fountains to the bus. Notably, as announced at the recent DVC annual board meeting, all rooms at Beach Club Villas will be getting a significant refresh throughout next year. As a DVC owner (though not at BCV), really excited about the updates!